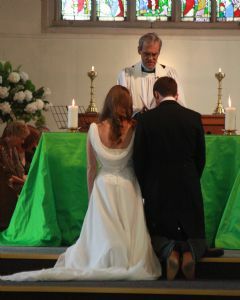 Firstly, if you are thinking of getting married in one of our churches we would like to offer you our congratulations. If you have any queries regarding your eligibility to marry in church, it is important that you contact one of the clergy to discuss your particular circumstances. A Wedding is one of life’s great moments, a time of solemn commitment as well as great joy. Marriage continues to enrich society and strengthen community. On their wedding day the bride and groom face each other, make their promises and receive God’s blessing for their new life together. Weddings are an important part of the life of the Marlborough churches and one of the varied ways in which we try to serve God and the community. To be married in one of the three churches it is necessary that either bride or bridegroom live within the Parish boundaries of Marlborough, Minal or Preshute. The Parish of Preshute includes the west side of Marlborough, Manton, Manton Hollow, Barton Park, Clench Common and houses in-between. The three churches are open to the public seven days a week, so please feel free to visit them or attend a service, before deciding on a particular church. Weddings are usually held on a Saturday between the hours of 11.00am and 4.00pm. What if I don’t live in one of the Parishes? You may also qualify If you have ever lived within the Parish (for six months or more), were baptised, attended worship regularly or your parents live or worship here. Also if your parents or grandparents were married in one of the three churches then you are eligible too. What if one or both of us have been divorced? If one or both of you have been married before, it may still be possible to get married in church, as long as particular conditions have been met. These need to be discussed with the clergy before you book your wedding. An alternative to a full wedding service is a Wedding Blessing or Service of Prayer and Dedication (also popular after a civil ceremony). Your intention to marry has to be formally announced in the church where you wish to be married. The three Sunday mornings for the calling of these Banns will be arranged with you when you complete your booking form. We would hope that you would be present on at least two of the three occasions when your banns are read out in church. If one or both of you live in another Parish, Banns must be called in the Parish church there too. It would be helpful if by the time you meet with the minister taking your service, you have found out which is your Anglican (Church of England) Parish Church. Banns give people the opportunity to point out any legal reasons why the wedding cannot take place. Thankfully such objections are very rare! Team Administrator before a booking is definite. You will then be asked to come and meet with one of the clergy who will complete your booking form with you. Your choice of hymns can be discussed in your meeting with the minister taking your service. In a separate leaflet you will find some suggestions. We have a team of organists in the area, one of whom will be booked for your wedding. The organist will discuss your music requirements with you, however, the organist may increase his fee if extra time is needed to rehearse with, and accompany, a soloist or choir. If you would like to have the bells rung, the bell ringers can be booked for your wedding. They will ring after the ceremony itself. We recommend that you produce an order of service with the words of the hymns and some of the prayers. (The clergy taking your wedding will advise on content). You may either produce this yourself, or ask the Team Administrator who will be able to discuss cost and production of the service sheet with you. If there is another wedding on the same day as yours, we will (with your permission) give you each other’s telephone numbers so that you can liaise on colours and cost. Within a month of the date of the wedding you should contact the church flower co-ordinator to arrange a convenient time for your arrangers to decorate the church. £30 heating in October - March (available other times if required). (A wedding video licence may also be required please discuss with the minister taking your wedding as soon as possible). You will receive an email confirming your wedding booking, we do not ask for a deposit. An invoice is sent out, usually by email, two months before your wedding date and fees are payable in full one month before your wedding. For further information or to answer any queries, please contact one of the clergy team.